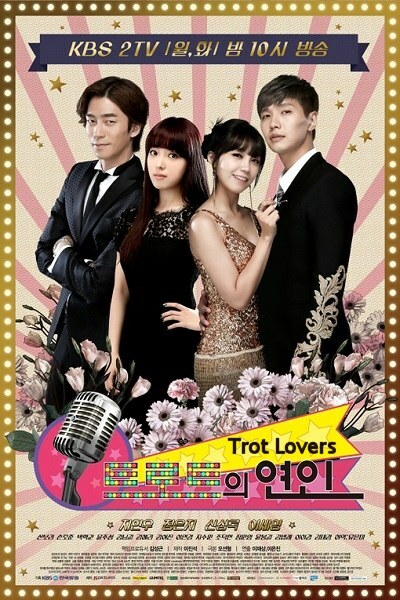 Trot Lovers (2014), a romantic comedy with music and dance sequences, has every story cliché in the book, including amnesia, but nevertheless I still enjoyed it. Many scenes were sweet and funny, and the actors knew how to take bare bones material and give it a special spark. I recommend this to everyone who likes simple stories told well. If you've been watching a steady stream of heavy duty melodramas lately and feel you need a break from them, to clear your head from all the depression, and want to watch something more inspiring, then check out Trot Lovers. There are some sad scenes, of course, but most of it is joyful and will make you feel good about life again. The cast features actors I've enjoyed in other dramas: Ji Hyun Woo of Queen In Hyun's Man (2012), Eun Ji Jung from That Winter The Wind Blows (2013), and Shin Sung Rok from My Love From Another Star (2013-14 - he played the murderous villain Jae Kyung, but here he plays a nice guy). The "other woman" (there's ALWAYS another woman) is played by relative newcomer Se Young Lee who was in the film Young Hot Bloods with Lee Jong Suk; she plays the jealous one who tries to separate the main couple. They make a good ensemble cast in Trot Lovers, and after a period of adjustment for me, where I had to convince myself not to think about Ji Hyun Woo with his prior leading lady and real life girlfriend (for awhile) from Queen In Hyun's Man, Yoo In Na, I eventually started enjoying him with Eun Ji Jung. She was a sweetheart in this drama; impossible not to sympathize with her (whereas in Winter she played a street-wise sharp mouthed young lady who fell in love with Kim Bum). I also had a big adjustment watching "Jae Kyung" as a far more gentlemanly type guy in Trot Lovers compared to My Love From Another Star where he played a crazy psychopath (he's particularly effective in those roles!). That's when you know you are dealing with solid actors, when they SO convince you they are one character in one drama and then they can SO convince you they are an entirely different person in another drama! All the side characters are funny in this show too, even the loan sharks will make you laugh! Also, I just have to mention the adorable little girl actress, Eun Mi Yoo, who plays Byul, the younger sister of Eun Ji's character. She just about made this drama for me, and constantly brought smiles to my face, she's a fantastic little actress. Move over, Shirley Temple! I had watched her in Hyun Bin's film The Fatal Encounter, but didn't recognize her in Trot Lovers because she wasn't wearing historical period clothing. She was a perfect casting choice and made you understand why Eun Ji's character worked so hard to nurture her after their father (played by Nam Gil Kang) disappeared. The Story: We begin at a city marathon where pop singer and musician Joon Hyun Jang (Ji Hyun Woo) is trying to get some extra positive publicity for himself, but using an underhanded manner to do so: he has his limo driver - right hand man Tae Song (Ho Jun Son) drop him off near the finish line so it looks like he had been running from the beginning and not just a few hundred yards. This cheating is witnessed by Choon Hee Choi (Eun Ji Jung) who is one of the coaches for the race, and she gets angry when she sees him accept the medal and she tries to get it back from him ... at a full speed run chasing after his vehicle in a parking lot. He manages to escape Choon Hee but later they run into each other when he gets caught by the press in a precarious situation: in a hotel room after sleeping with a girl Park Soo (Se Young Lee), who is a flirty and easily jealous singer at his music publicity company, the press mistakenly thinks he slept with Choon Hee since she had arrived to get the medal back from him. They have to make a dash for it so the cameras don't snap their pictures. However the next day Joon Hyun has to face half naked pictures of himself in the newspapers and his publicity-music company drops him. He now owes them back lots of money for their expenditures in preparing for his future concerts that will now never take place. From star to has-been loser overnight. Meanwhile Choon Hee and her little sister Byul have their own financial problems when their father Myung Shik Choi (Nam Gil Kang) runs off and abandons them after getting an immediate payment bill for $30,000 for money owed from loan sharks. They come and remove everything in their father's little restaurant shop as part of the payment and tell Choon Hee she is not off the hook for the rest just because she's not her father. She and Joon Hyun have another inexplicable, fateful "meeting" when loan sharks attack them both and try to bury Joon Hyun in a pit of dirt up to his head. Although at this point she doesn't like him one bit Choon Hee doesn't want a murder on her conscience as she sees Joon Hyun's head start to disappear in the pit, so she tells them she has an audition to win a musical contract for her ability to sing and gives them an amusing sample demonstration of her singing near the pit. The loan sharks soak it up and agree to give her extra time to come up with the money if she can win the contract with the music company. She nervously prepares for the audition, and while her start is shaky, she finally comes into her own by singing and dancing to a famous Trot song -- she had grown up listening to her mother, now deceased, singing and loving Trot songs, so that is what she feels comfortable with, despite others making fun of her for choosing old-fashioned music to love. (Trot music apparently became popular in Korea under the Japanese rule of their nation early in the 20th century and features a one-two beat driving rhythm that is good for dancing -- although to me the music often sounds more Chinese than Korean or Japanese). She's an unexpected hit with the public and now Joon Hyun has to hitch his own tails to hers to try and salvage his own career. Could it possibly be a beneficial partnership and would that help pay off her father's debts? Will her success after winning the contract with Shine Star Entertainment make other singers jealous? What about her personal life? Executive Geun Woo has a crush on her but it seems more and more Choon Hee favors Joon Hyun, who used to be an arrogant sun of a gun, but who is now turning into a decent human being due to the power of love entering his life. He even gets along with little Byul and she adores him too. Will Choon Hee's father ever return to make things right for his two abandoned daughters? The plot deviation that I didn't care for was the amnesia bit when Joon Hyun temporarily loses his memory, and then when he does regain it he pretends he hasn't for awhile. Oh that amnesia stuff has been played to death in K-dramas for over a decade! I think they could have done without it somehow, but thankfully it doesn't last long at all and also plays a part in bringing our main couple together, and also exposing the wrong-doing of the jealous Park Soo and her mother who are out to destroy Choon Hee. My favorite scenes were the music scenes -- though I felt there could have been more of those -- and all the scenes with adorable Byul. Then I really loved the little music museum scenes (pictured above) where the main couple play around with objects that create different sounds. I think the actors enjoyed those scenes too, their faces radiated peace and happiness while playing those scenes together. I hope you give Trot Lovers a try someday. It's a very pleasant way to relax and enjoy a nice romantic story. Bye! I'm off to play insane Kim Do Chi next in The King's Face!